While the XL-Seat isn't a turning seat in the true sense of the term it does provide the same benefit in aiding the user to access the vehicle into a normal driving or riding position. The XL-Seat is a transfer assist device from Adapt Solutions that is designed to aide wheelchair users transfers from their wheelchair to the driver or passenger seat of a minivan, pickup truck, SUV and some crossovers. The XL Seat does not affect the functions of the vehicle seat and does not normally require any modifications that will affect the value of the vehicle. Basically, the XL-Seat is a flat platform that is mounted beside the seat in the door opening that will lower and rise electrically. The transfer board is mildly padded and covered in vinyl for comfort and ease of use. Included with the XL-Seat is an armrest to provide support during transfers. 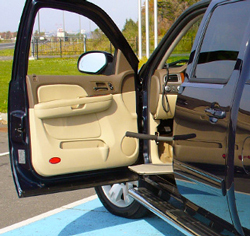 The XL-Seat transfer board normally sits vertically between the seat and the door of the vehicle. To access the vehicle the user opens the door, folds down the transfer board, lowers the board to the height needed for their style of transfer and transfers onto the board. The user then raises the transfer board to the height of the seat so they can then safely and easily slide across onto the vehicle seat. Once the user is positioned properly in the vehicle seat they can flip the board back up vertically and close the door of the vehicle. Leaving the vehicle is simply a reverse of the above actions. 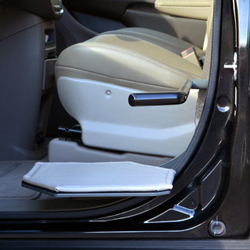 Note: Because the XL-Seat will impede access to the vehicle seat for those who don't need a transfer assist the transfer board has been designed so that it can be easily removed when not needed. Transfer Board 15 ¾" by 17"